My father has made making nachos into an art form. He always gets so excited to serve up a plate when people come over. DID YOU KNOW, that my father used to own restaurants? Two to be exact. He owned a small little place in Chicago when I was young so I don't remember much of being a part of that. But, when I was in college, he opened up an amazing restaurant in the suburbs and I was lucky enough to help launch it. I remember learning the computer systems and helping train the employees, working from 7am to 7pm doing all of the jobs. It was invigorating, and the food was the best (maybe I'm biased, but he had great chefs). He has since sold it, but it's still up and running, and I'm so proud to have been a part of that. 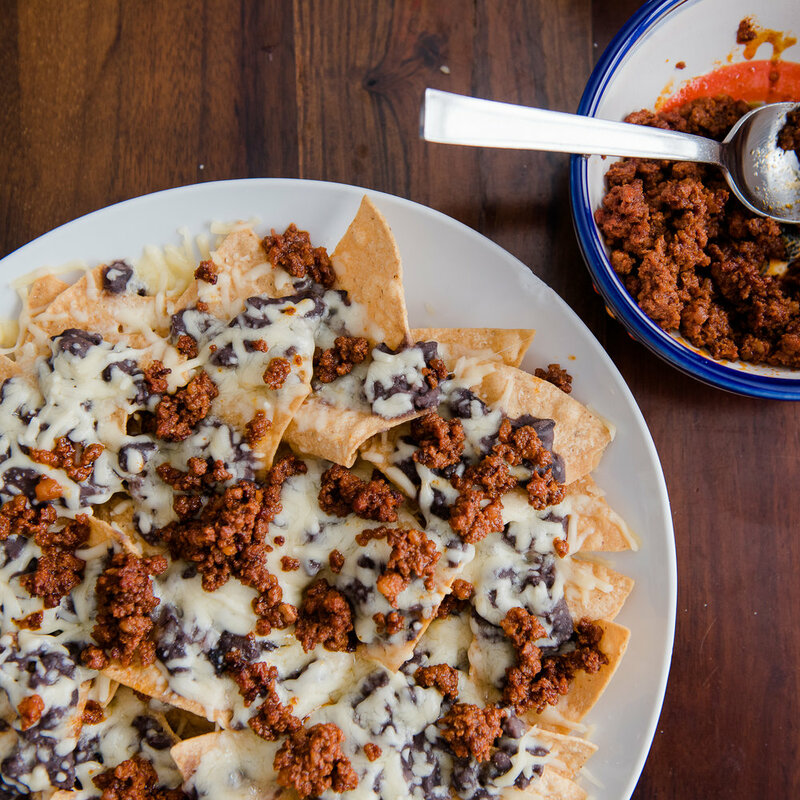 His nachos are a great appetizer to make if you're having people over. I'm sure it will be a hit, and will look like you're serving something from a restaurant. 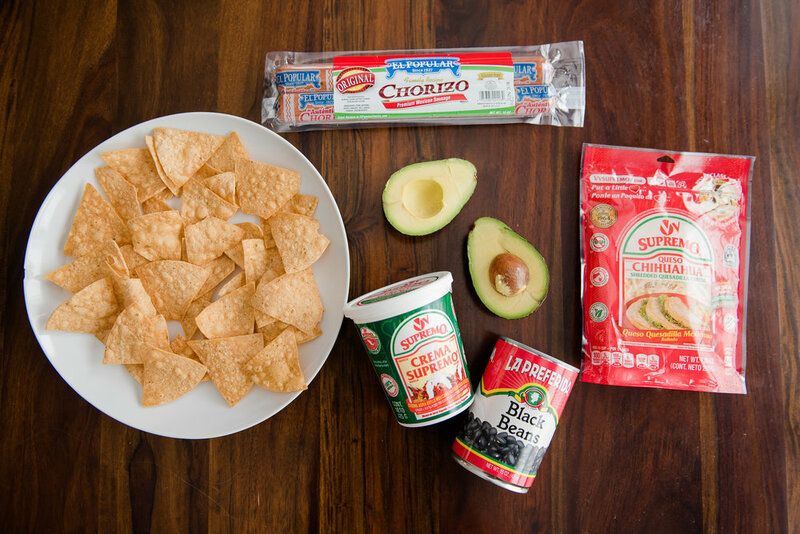 It's definitely something a little more authentic than a nachos and cheese dip. 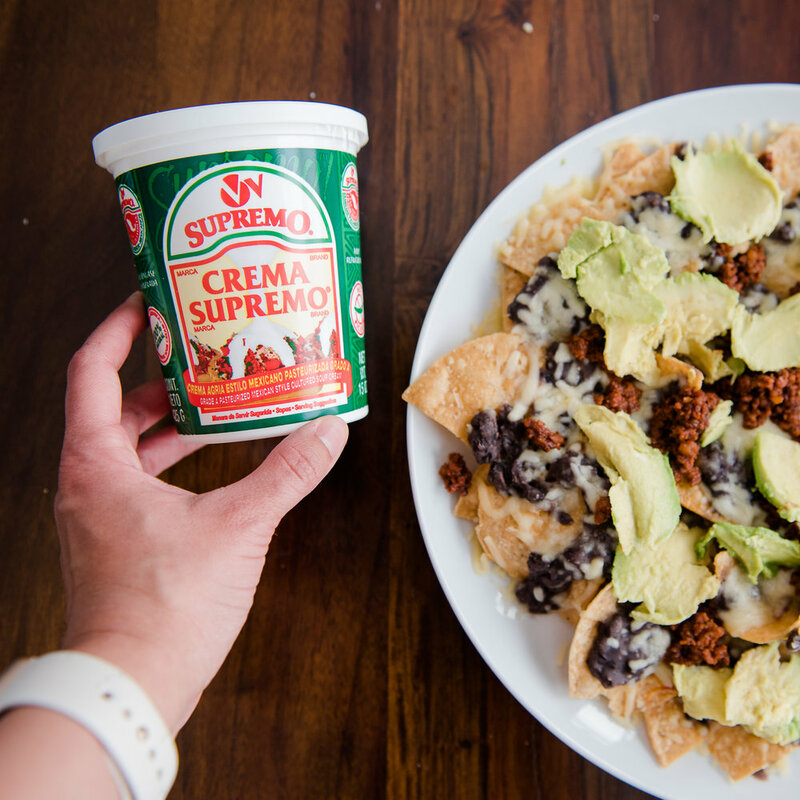 Crema (this is Mexican sour cream, it's not as thick and is a perfect consistency for spreading. 1. Heat your beans and use a masher to mash them. 2. Heat your chorizo. Use a spatula to break it up like ground beef. 3. Assemble the nacho chips on your plate. 4. Once beans are mashed and heated pour onto chips. Add chihuahua cheese. 5. Put plate in the microwave and heat for 60 seconds so the cheese can melt. 7. Use a spoon to scoop out avocado in slices. This technique will help cover the nachos better than if you were just to cut the avocado in squares. 8. Lastly top with the crema. 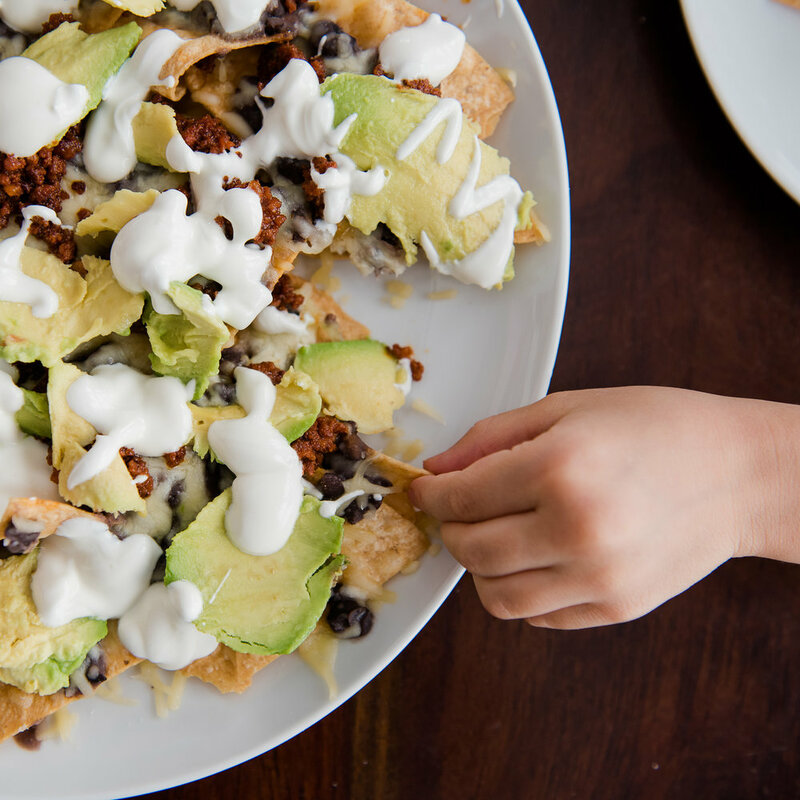 Michael LOVES making nachos and usually finds any excuse to have them for dinner. Yes... he'll have this as his meal... usually when I'm not going to be home for dinner. Needless to say, he wasn't at all upset that he got to eat this plate of nachos after I was done shooting. I feel like nothing makes me happier than a meal that takes less than 10 minutes to prepare, will feed the whole family, and is less than $10 to make. This week, I had Michael assist me with preparing this. I pretty much just took the pictures, and ate it. Huevos Rancheros is a common Mexican breakfast, but lately it's been a life saver to have for dinner especially on the days that my daughter has ballet class and we don't get home until 7:30pm. I could seriously have this every week. Scroll down for the recipe, and you might even make this a weekly meal for your family when you're pressed for time. 1. Heat the oil in your pan. Fill it about 1/2 inch deep. 2. Depending on the size of your pan, add in 1-3 tortillas. It's ok if they overlap a little. 3. Fry them, and set aside on a paper towel to drain extra oil from them. 4. When all your tortillas are fried, (one per egg) turn down the heat to fry your eggs. 5. You can fry as many eggs as will fit into your pan. I prefer mine over medium, so while they're cooking I just push a little oil over the top of them to cook the yolk slightly. 6. When they get a little crispy on the edges take out and place on top of your fried tortilla. 7. Add the heated salsa on top of your egg. We used to have this meal every Saturday growing up. We would eat while we watched The Brady Bunch as a family. Anyone else watch that show? It's still one of my favorite meals. Like I said before, it's so easy to make, it's inexpensive, and it's delicious. Give it a try and tell me what you think. Rice and beans are a staple in Mexican food. They're pretty much included with any Mexican main dish. Whenever we are eating Mexican food, it's assumed that at least one or both will be part of that. I'm sure you've seen those store brand "Mexican rice" boxes, but I want you to know that there's a better option that's EASY to make, so much better, and cheaper...and serves a lot more people. Every time we make rice for the family, we end up having leftovers that last for another day or two. 1. You're going to need hot water, so you'll want to make sure you put your 4 cups of water on the stove to boil. 2. Put oil in the pan, and add your rice. Mix until all your rice is covered with the oil. 3. Let rice brown. You want it to look toasty, not burned. 4. When the rice is tan, add the water in. 5. Add tomato & onion first. Mix. 6. Add in the bullion*, mixing throughly so that it all gets dissolved. 7. Cover and let simmer for about 20 minutes. 8. When the water is all absorbed it's done! Yay! *It helps to add one table spoon first, then taste the water before adding more in case you're satisfied with the flavor. Add a half a table spoon, taste. If you still want more flavor add the last half of a tablespoon. Mix well. This is seriously super easy to make. Even my son who is 4 helped me out, and could probably do it himself. Give it a try. It's that time of year where you might be scrambling to pull out an awesome dessert as the host of a family dinner. Or if you're a guest, you want to bring something more unique than the typical sugar cookie doused in red and green sprinkles. 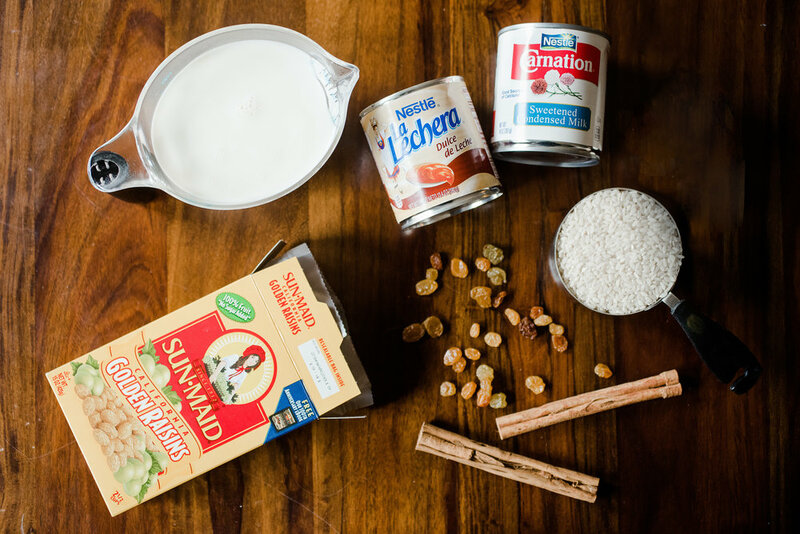 Well I have a great idea that could really impress your friends and family this holiday season: Arroz con leche (translated: "rice with milk"). It's pretty much the Mexican version of rice pudding. All in all, it's a big bowl of deliciousness. It can be eaten as a hot dessert (which is what I prefer) or cold in the morning as breakfast. With only 5 ingredients, it's pretty easy to make. I searched google for a recipe that I thought looked familiar, but there are SO MANY versions of arroz con leche that I decided to make up my own. I don't know if it's "right," but it's simple and it tastes good, so I'm sticking to it. I'm all for the super simple instructions, so I'm going to lay it out plainly for you. 1. 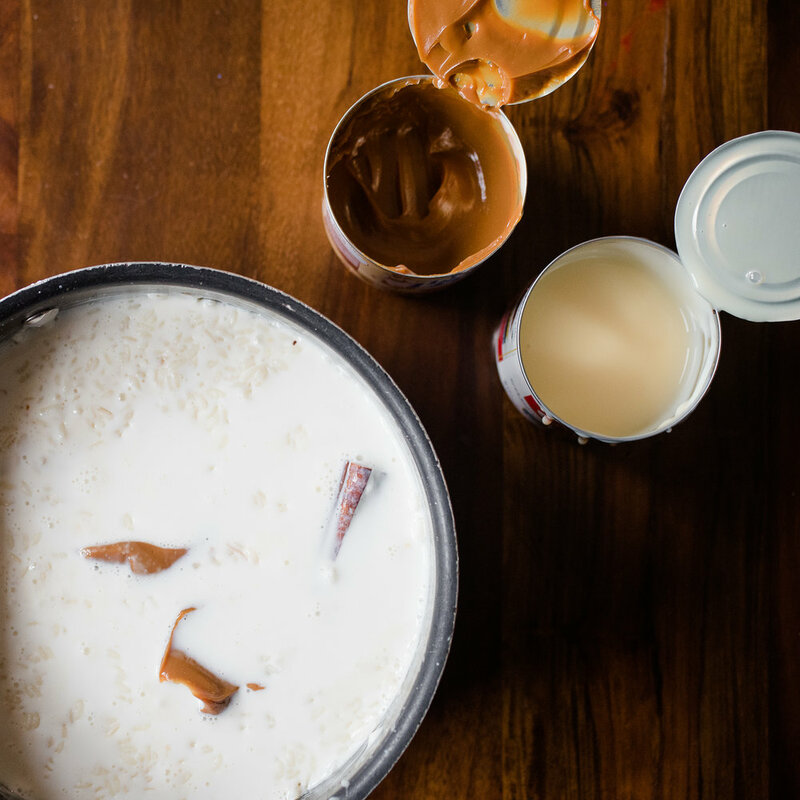 Pour 2 cups of milk in your pot, add cinnamon sticks, and add in your rice. 2. 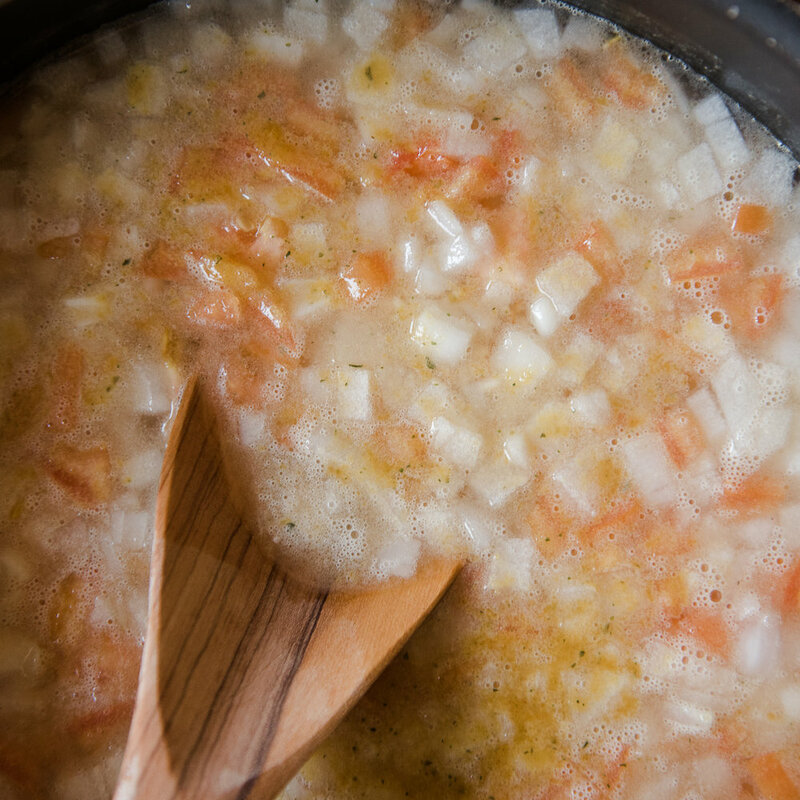 Bring to a boil, then turn heat low so it will simmer. 3. Let the rice cook and soak up the liquid. About 10-15 minutes. 4. Add 1/2 cup of milk and stir, letting the milk absorb into the rice. Let your liquid content get lower. 5. Repeat #4 until you have 1/2 cup of milk left. Stir occasionally. 6. Add your last 1/2 cup of milk, along with La Lechera & Sweetened Condensed Milk let it soak up while stirring occationally for another 5 minutes. 7. You want it to be creamy with some liquid to it, but not like a soup. The right consistency is a soft pudding-like rice. Similar to a risotto. Keep in mind that more liquid will evaporate as it cools. 8. As you let cool you can take out the cinnamon sticks, and stir in a handful of the white raisins. *refrigerate the leftovers...if there are any. There are so many versions that honestly you can adjust to your own liking. This dessert is good hot OR cold. It can be an after meal dessert OR breakfast. Let me know if you have a favorite passed down version. I'm always so interested in the other ways people make the same dish. Merry Christmas, everyone! Hope you enjoy lots of time with your family and friends! Join the mailing list to be the first to know when there's a new collection launch, exclusive promotions, new blog posts like this one, and to get a behind-the-scenes look as Karina travels to capture work for new print offerings. Right now there's 10% code for subscribers, so what are you waiting for? Put in your e-mail below. I remember every year we would have a family "putting up the tree and decorating the house" party. My grandparents would come over on a Saturday and we would spend the afternoon and evening doing all things Christmas. My grandparents would bring over pan mexicano (mexican bread) and my mom would make Mexican hot chocolate. I never liked Mexican hot chocolate. But now...it's the best hot chocolate I drink. And my kids agree. 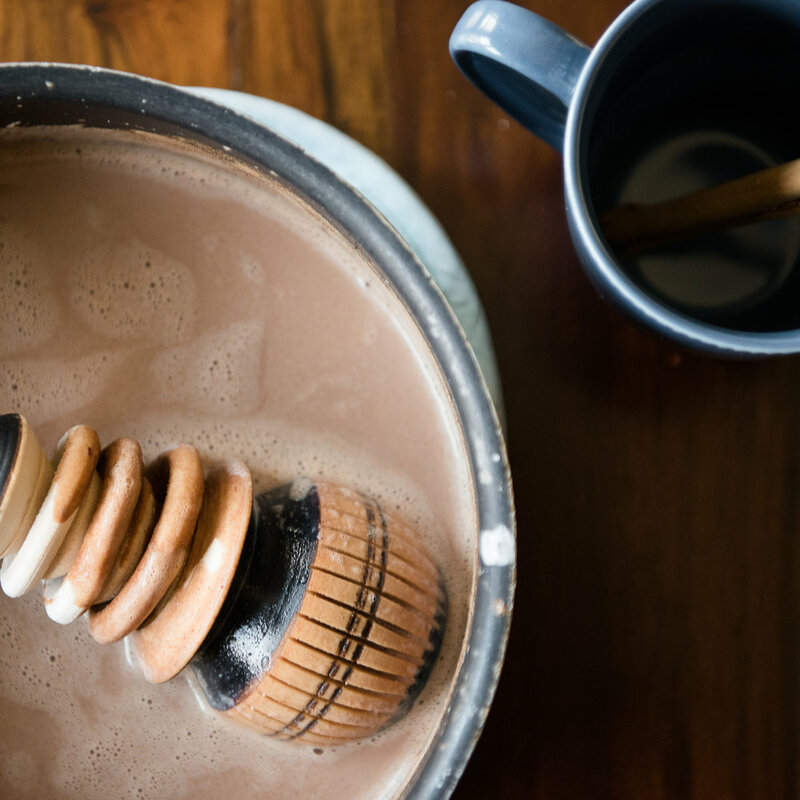 Mexican hot chocolate isn't like the regular hot chocolate you might be used to. It's not as sweet and the ingredients are a bit simpler. This chocolate is actually the only hot chocolate that doesn't give the kids a stomach ache. So how do you make it? Mexican chocolate: I used Ibarra chocolate from Mexico, but there's also Abuelita which is a product of Nestle. You'll only need one tablet per 2 cups. You're going to want to cut the chocolate into pieces. The tablets come in a circle, but you can cut them with a little bit of strength and your knife into triangles. Heat the milk in a sauce pan. When the milk starts forming little bubbles, add in the triangles of chocolate. It should melt pretty quickly. Have your molinillo* or whisk ready and start stirring until the chocolate is melted. Turn the heat low/off and keep whisking to make froth. The froth is key to making this taste amazing. If you're a millennial like me, it will be faster to use a blender. You can pour the hot chocolate in a blender and blend on low for a minute. Pour into your mug and top with a cinnamon stick. Some ingredients in the chocolate will settle to the bottom so use the cinnamon stick to stir.